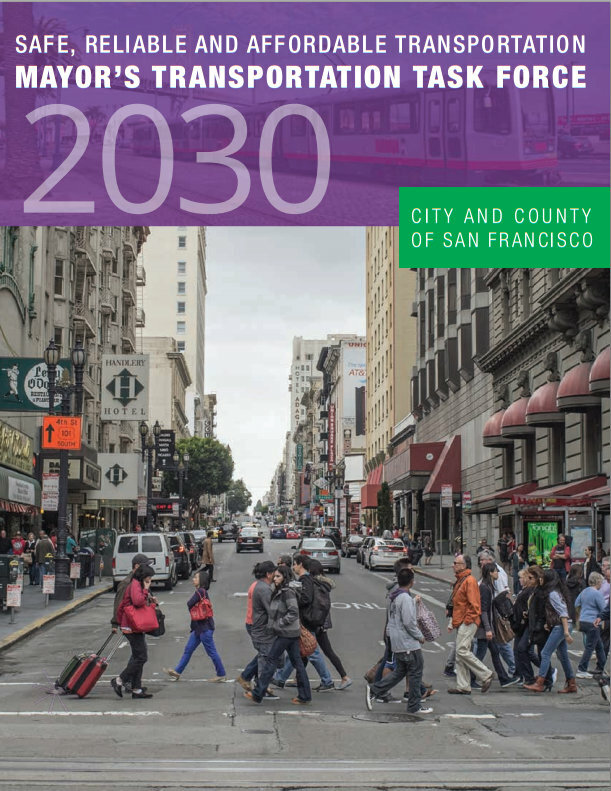 The funding measures recommended by the Mayor’s Transportation 2030 Task Force are a promising step toward building out the safe, reliable networks for transit, walking, and biking that San Franciscans need. Only a portion of the $10.1 billion needed for improvements identified by the task force would be funded by the measures, but if approved by voters on the November 2014 ballot, they could build traction to help city agencies obtain the rest. The Municipal Transportation Agency expects to receive $3.8 billion in revenue over the next 15 years to pay for transportation needs, but that leaves the city $6.3 billion short. To close the gap, city leaders should ask voters to take three actions that would raise almost $3 billion and help attract federal, state and regional funds to pay the rest, [said Monique Zmuda, deputy city controller and co-chair of the task force]. — Two $500 million general obligation bonds — one in November 2014 and another in November 2024. — A measure to raise the vehicle license fee from 0.65 percent to 2 percent — in November 2014. State law allows San Francisco voters to restore the fee, which was cut by Gov. Arnold Schwarzenegger. — A proposition that would increase the sales tax by half a cent — in November 2016. That would raise the city sales tax from 8.75 percent to 9.25 percent. “This kind of investment will show the kind of commitment the citizens of San Francisco have, and that will help get grants and other funding,” Zmuda said. “It’s great to see the mayor and supervisors articulate the incredibly important role that excellent transportation — including biking — plays in making our city a great place to live, for everyone,” said Kit Hodge, deputy director of the SF Bicycle Coalition. Tomorrow, a Board of Supervisors committee will hold a hearing called by Supervisor Eric Mar on how to fund the SFMTA’s Bicycle Strategy, which lays out two primary scenarios for installing a network of safer streets to make bicycling accessible to more San Franciscans. The “Strategic Plan” scenario, which the SFMTA estimates would increase bicycling to an estimated 8 to 9 percent of all trips, would require $200 million over six years. The “System Build-Out” scenario, which is projected to meet the city’s goal of 20 percent of trips by bike by 2020, would cost $600 million. In total, the task force ballot measures would provide $316 million to split between the Bicycle and Pedestrian Strategies from 2015 to 2030. Walk SF Executive Director Nicole Schneider applauded the task force’s efforts to set the city on a course to fund the Pedestrian Strategy, which calls for a 50 percent reduction in pedestrian injuries by 2020. While Mayor Ed Lee has said increasing funding for the Bicycle Strategy is not a priority, he promised at Walk to Work Day not to let the Pedestrian Strategy “sit on the shelf.” Of the estimated $363 million called for in the plan to implement safety upgrades on priority streets by 2021, the city has a $215 million shortfall, which the Mayor’s Task Force measures could help fill. SPUR Executive Director Gabriel Metcalf, the chair of the Mayor’s Task Force, told the Chronicle that getting the funding measures approved is a crucial step toward averting a more car-clogged future for San Francisco, and that he’s confident voters will pass them. The proposed GO bonds appear to be the most promising means to finance the implementation of the Muni TEP within the next few years. The TEP calls for a major expansion of transit-only lanes and other upgrades to make many routes faster and more reliable. The TEP is expected to not only improve commutes and attract more riders, but to also cut down on Muni’s operating costs. The task force’s investment plan recommends spending most of the new revenues – about 54 percent – on maintaining and repaving streets, rehabilitating and maintaining the Muni fleet, replacing rails and overhead wires, paying the city’s share to operate Caltrain, replacing escalators and elevators in combined Muni-BART stations and developing safety improvements for bike riders and pedestrians. About 32 percent would go toward enhancing the existing system, with improvements to Muni maintenance facilities, some of which date to the 1920s and can’t even fit existing buses. The money would also go to efforts to speed up Muni buses, including a bus rapid transit arrangement on Geary Boulevard, adding canopies at shared Muni and BART stations, and paying to transform Market Street to boost transit travel speeds and make it safer for bicyclists and pedestrians. We ought to ask development to pay more of its infrastructure costs. We need to figure out how to accommodate job and housing growth with sustainable transportation modes, with less congestion, less demand for road space and parking, and less wear-and-tear on streets than conventional development. We need to explore more “infrastructure efficient” development – concentrating job growth around existing and planned regional transit hubs, minimizing expensive road and parking construction in new development areas, and encouraging housing where transit and street infrastructure already exist (like West Portal Avenue, which has three streetcar lines, but is only zoned for two-story buildings). The full 2030 Transportation Task Force report is available on the Planning Department’s website. Or adding transit to where density already exists: North Beach and Central Subway. Great piece, Arron. I would have liked to see some discussion of the Transit Equity Charter Amendment backed by John Avalos, which will compete for votes with this initiative in November. Congestion pricing would raise $60 to $80 million per year in revenue and can be used to encourage car pooling out of the city and help increase bus speeds during peak hours by reducing cars on the street… Not to mention get non-residents who drive on our streets to pitch in financially since the VLF, GO Bond, and sales tax increase can all be avoided by one who simply packs a lunch (and may use a handicap placard to definitely not contribute a dime otherwise). How about raising the existing residential building height limits one more story? That would give us the triple benefit of more property taxes and fees, increased rental stock, and the density we really need to make transit efficient and affordable. Is it simply inconceivable that more of the 8 billion dollars in general funds go towards transit? How do other cities pay for their public transit? Other cities don’t have 700,000 daily boardings. Also, this amount is for the next 3 decades so it makes more sense seen over a long term, especially when much of the money needed is to make up for decades of neglect and disrepair. I don’t understand why the bus fare isn’t raised to $2.50 or something. If you live here and use transit often, you probably a monthly MUNI pass. Seniors, disabled, and kids get free or heavily discounted passes. Infrequent resident users and visitors (hello tourists!) probably would think nothing of paying $2.50 per ride … could probably even raise the F Market fare to $5 (just include it on those monthly passes us residents buy). There’s no good excuse to not talk about raising fares. If congestion pricing applied in both directions – for commutes out of the city, not just in – it could help transit fro San Francisco to Silicon Valley, in addition to Muni. That would address some of the concerns about the Google buses not contributing to the city. How Will SF Fund the Sustainable Transport System a Growing City Needs?